The tour is beginning its second hour and the participants have started to drag along somewhat lethargically — the food coma appears to have settled in. One girl whispers to her boyfriend, “I don’t know if I can eat any more…” But then she perks right up at the sight of a pickle-topped pulled pork barbecue slider and a side of coleslaw. Even though the barbecue is really good, my heart is still sitting at a plastic-tablecloth-and-mismatched-chairs kind of joint just a few blocks away, lost in a moment of unexpected taste bud bliss. Grits. This is the fifth (or is it sixth?) 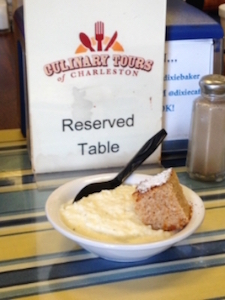 stop on the Culinary Tours of Charleston. Their website promised the tour to be enough for a light lunch over the course of two and a half hours. Expecting to have very small sample-size dishes at one or two places, we’re all a little surprised to be feeling so full. There were crispy fried green tomatoes with savory scratch-made pimento cheese. Sweet tea and toasted-to-perfection benne wafers, presented with a story of their distinguished Gullah history. Bowls of Charleston red rice, spicy collard greens, and a plate full of hush puppies with praline butter. Hush puppies gone, many of us ate that creamy, salty-sweet butter with our spoons! Our tour guide, sassy and southern as they come, gets us moving quickly with a few short words before sauntering towards the door: “Get moving or get left behind.” It seems that this group is savoring the unique flavors of Charleston at too slow of a pace. Maybe the slowness of the South has crept into our stride, or maybe it was that last bite of sweet potato fries. Rounding the corner, our guide points to the sweets shop ahead. She’s describing the decadent fudge and melt-in-your-mouth pralines, but slowly her voice fades away, being replaced by the whisper of something simple and comforting, like being welcomed home. Thoughts of the grits at the first tour stop are nudging their way through the merits of fudge versus pralines, and whether turtles might be the perfect happy medium. Personally, I could trade the entire tray of sweets for one more spoonful of those perfect grits. Not just the best in town. The best I’ve ever had. Dixie Supply Bakery & Cafe has etched itself into my heart with one single taste of their creamy grits, cooked to perfection, without any pretention. When facing the multitude of options in the culinary capital of the South you may be tempted to overlook a humble storefront bakery cafe sharing parking lot space with a gas station. Entering the cafe you’re greeted by the order counter and a menu chock full of southern classics such as sausage gravy and biscuits, fried chicken and waffles, and of course… shrimp and grits. Pull up a chair at a table covered in blue and yellow striped vinyl, wait for your order of steamy, buttery grits, and check out the accolades hanging — or spray painted — on the wall. It’s impossible to miss Food Network’s Guy Fieri smiling down on you, waiting, like he knows that you’re about to have a lusty moment in the corner with your bowl of grits.